The film was designed to addess the problem of afternoon (or morning) sun shining through an office window. An office worker will be uncomfortably hot sitting in the sun and due to glare on the computer screen unable to see the screen to work. The film is reflective externally to reflect 80% of the heat and dark internally to eliminate glare. This film blocks too much natural light to be used in the home - it requires the use of artificial lighting to see comfortably during the day. 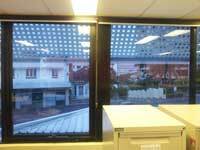 Reflective window tinting films provide the highest heat protection by reflecting the heat away from the window. It gives the window a “mirrored” appearance externally. These films provide privacy and protect against sun damage and fading.